Humankind’s relationship to trees goes well back into pre-history. Early people might not have had the same knowledge we have about the necessity of trees in our ecosystems, where they exchange carbon dioxide for oxygen in the air, and build soil through the decay of their leaves and dead wood, and their support of networks of fungi below ground. But the ancients certainly honored and valued trees, and saw in them spiritual meaning. This piece is called “The Memory of Trees,” which might refer to the fact that trees have a built-in memory of their own history, through the rings of growth that record their times and seasons; temperature, moisture, and other conditions. There are living trees in the world that are nearly 5,000 years old, which means their memory stretches back to before those Psalms were composed! Scientists at the Laboratory of Tree Ring Research in Arizona are using data from tree rings – the memory of beings with much longer life-spans than ours – to understand changes in climate over many centuries. But “The Memory of Trees” might also refer to our own relationship with trees. If you look around you, you will undoubtedly see many things, from furniture to books to toilet paper, that are made out of trees. And you might think back over your life, and remember particular trees that have been important to you. One of the first that comes to mind to me is a lovely big Colorado Blue Spruce that grew in a neighbor’s yard when I was very young. It had a magical space beneath its lower branches where a kid or two could climb under it and feel like they were invisible and protected by this great being. See below the picture for details about how this piece was made! 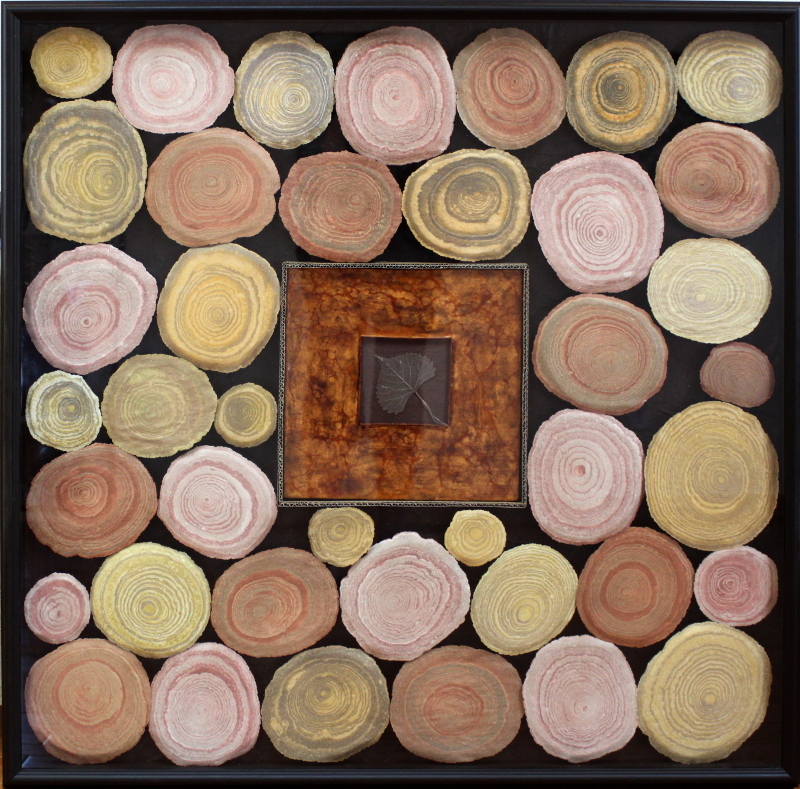 The Memory of Trees – 42″ x 42″ – hand-marbled paper, cardboard, wax, Colorado earth pigments, shellac, skeleton leaf. The idea for this piece started when I was teaching a class in paper marbling, and spent a whole afternoon making these tree-ring forms by alternating two colors of pigment touched to the same spot on the size. The “ink” is Universal Colorant, which is the stuff your local paint store mixes into different bases to make house paint. 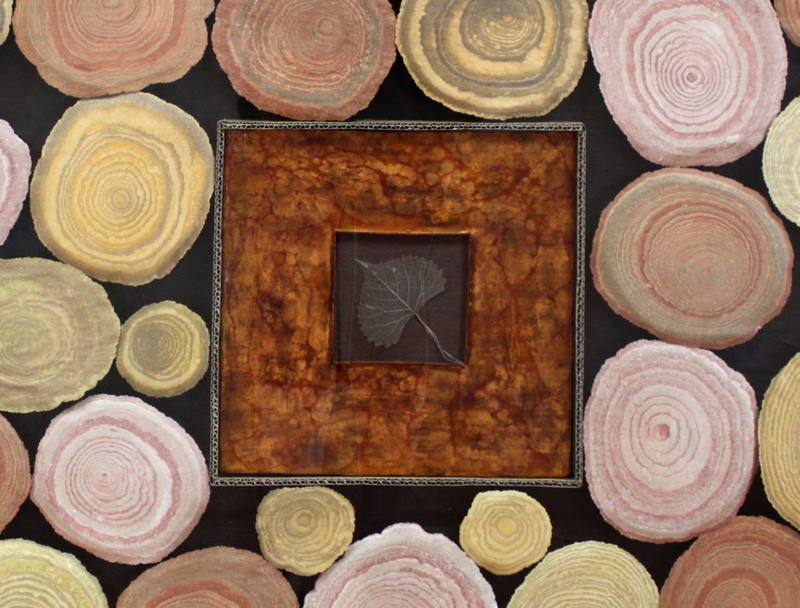 The piece is in a shadow box, so each circle of marbled paper is raised up on a platform of cardboard to make it three-dimensional. The focal point in the center is a skeleton leaf that a friend found and cleaned up and gave to me, (thanks, Barb!) and its background is some beautiful purplish-brown earth that I collected near the top of Raton Pass in southern Colorado, mixed with an acrylic binder. The frame around the center is a panel covered with wall plaster, then several layers of wax, which also have earth pigments mixed into them. The final layer, which appears dark red in the photo, is shellac that has been spread over the wax and then fired with a torch. Dear Janet, I am in awe. Your concept is so moving, and I have revered tree’s rings for years. We did some logging during the early 80s. We were harvesting first growth lodge poles, some of which were larger than you could encircle with your arms. They were amazing.